Since July 3, Gen. Abdel Fattah al-Sisi has made it clear who runs Egypt: he does. He faces two great challenges. One is the Islamist element, spoiling for a fight to take back the power it so recently lost. The other, my focus here, is the economy. The country once famous as the "breadbasket of the Nile" now imports something like 70 percent of its food. To make matters worse, decreasing income could mean that the money will just not be there – other than gifts from Saudi Arabia and other governments – to fend off starvation. Plus, the prospect looms of severe cuts in the country's Nile water allotment. What to do? If Sisi is to break the bonds of Egyptian poverty, he must end the subsidy regime and pull the military out of the economy. 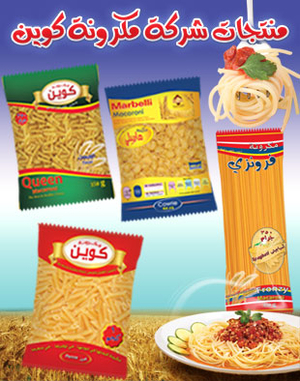 An ad for the military-made Queen Macaroni products. range from consumer goods such as laptops, flat-screen televisions, sewing machines, refrigerators, pots and pans, plastic table covers, butane gas bottles, olive oil, and bottled water to medical equipment, tourism, real estate, and gas and energy. The military owns and operates no fewer than nine factories for macaroni. It also invests in infrastructure projects and owns land. The military has grown so large because of preferential tax treatment, subsidized labor, an extra-legal status, old-boy networks, and many other privileges, such as not having to cope with the civilian bureaucracy. Its enterprises run along socialistic lines and are steeped in nepotism and baroque forms of corruption. Ever since Rowhani's victory in the Iranian presidential election [in June 2013], there has been a growing swell of voices in the country calling to restrict the involvement of the armed forces—and particularly the Revolutionary Guards—in the economy. Last week Majles member Ahmad Tavakoli called on the government to limit and redefine the involvement of military officials in the economy. Just several days later, the Alef website posted an editorial in which it referred to the military's penetration into the economy as "the mother of all diseases". The website warned that the growing involvement of military officials in the economy encourages them to step up their political involvement as well to promote their economic interests. Economist Dr. Ali Ghanbari also called on the government to put an end to the military's economic involvement, arguing that it puts the economy in danger and keeps the private sector from playing a major role, which is vital for economic development. As a result of the growing criticism of the armed forces' involvement in the economy, top officials in the defense establishment, including the commander-in-chief of the armed forces and the spokesman of the Revolutionary Guards, have recently been obliged to respond to the arguments made with regard to the issue and provide justification for the involvement of the military establishments in national economic projects. For details, see the full report. Nov. 6, 2013 update: Dalibor Rohac takes up the other great economic challenge in "Solving Egypt's Subsidy Problem." The basic recommendation is to replace subsidies with cash transfers. Dec. 5, 2013 update: The prospects of serious economic reform in Egypt have dropped yet further with the news that friendly Persian Gulf states have invested $50 billion in 66 projects. Oct. 6, 2014 update: I offer a larger view of this problem today at "Hunger Growls in Egypt." May 17, 2016 update: David Schenker of the Washington Institute for Near Eastern Policy asks, "Will Sisi Squander His Chance to Fix Egypt's Economy?" in the National Interest. He is not optimistic. Absent the recent US $22 billion in Saudi aid, he writes, "Egypt was seemingly on a glide path to economic collapse. Egypt has long faced economic challenges, but over the past [three] years—since Sisi took power in a military coup—the situation has markedly deteriorated," to the point that "Cairo's finances, the Sisi administration's durability and Egypt's stability were all increasingly at risk." While he has made concerted efforts to encourage foreign direct investment, Sisi has not tackled Egypt's core structural economic problems, chief among them the military's oversized role in the financial system—the army controls an estimated 30 percent of the economy - and food and energy subsidies, which account for nearly 20 percent of the annual budget. The Saudi funding "represents an opportunity for Sisi to finally undertake serious structural reforms," but "it's unclear that Egypt will capitalize on this opportunity." Schenker notes that "The last time when Sisi was flush with cash—Saudi Arabia, the UAE and Kuwait gave Egypt $20 billion in 2013 -- instead of making difficult decisions, Cairo muddled through, squandering the windfall and the chance for real and enduring change." Armed Forces spokesman Mohamed Samir says the army intervened to end attempts to manipulate the price of baby formula. "The army, which cannot ignore its civil role, acted to disrupt the manipulation of the price of a strategic product that was imposing a burden on ordinary citizens," said Samir. The Armed Forces also issued a statement denying rumours it was hoarding baby formula in its warehouse prior to selling it in the market. "The imported formula will be sold for LE30 instead of the current LE60 per box. This is a 50 per cent decrease in price," read the statement. Several months ago baby formula was being sold for LE16. As the exchange rate of the pound fell the price increased and the same boxes now retail for LE 60 — "a huge burden on families with limited incomes" says Samir.